There's a school of thought whereby hikes along circular routes are viewed as hikes to nowhere. But even while I have to admit to often having a sense of accomplishment from going on hikes that take one some distance from one place to another, I have come to be able to enjoy certain hikes along circular routes in terms of the journey itself yielding so many enjoyable sights and experiences. A warning sign with an image of a "man"
who looks like he's having fun! Back when I was still living in Philadelphia, I viewed a modest Hong Kong movie that helped me to realize that the Big Lychee is not all concrete jungle. Sai Kung Story may not be a cinematic gem but the 2003 drama still contained enough visuals and other elements that made me want to visit the Sai Kung District -- and this even before learning, like I got to doing after moving to Hong Kong, that Hong Kong's second largest district possesses not one but three beautiful country parks in Sai Kung East Country Park, Sai Kung West Country Park (which includes a Wan Tsai Extension) and, also, Clear Water Bay Country Park. Sure enough, I have indeed checked out quite a few sections of Sai Kung district, starting with Sai Kung town and then spreading out to various parts within the country parks (see examples here, here and here) since then. But for the most part, I've tended to visit during the day and been intent on getting out of the area as quickly as I can post hike to avoid getting caught in the traffic jams (and attendant long wait for mini buses) that regularly afflict Sai Kung town on weekends. However, when my mother and I were in Sai Kung late in the afternoon yesterday, we discovered that the town was actually quieter and less crowded than on a regular weekend -- the opposite of what I'd have expected of the place on Christmas Day. Consequently, we decided to stay until later than originally planned and ended up leisurely strolling along the waterfront, stopping for a time to buy and consume a packet of freshly roasted chestnuts as well as admire the views, and also doing such as having dessert at the original branch of Honeymoon Dessert in town. And now to this week's theme -- for which I found a plentiful number photos in my archive that would fit but ended up settling on the two above of large outdoor stoves built in anticipation of such facilities being needed for people fleeing from the invading Japanese military forces who already had been waging a war in China since 1937. (The Sino-Japanese War of 1937 to 1945 was the largest Asian war of the 20th century and, after the Japanese attacked Pearl Harbor and launched near simultaneous invasions of Malaya (now West Malaysia) and elsewhere on December 7/8th, 1941). Accessible via the Quarry Bay Tree Walk, these emergency kitchen facilities are now located within Tai Tam Country Park (Quarry Bay Extension), a place of natural beauty and general quiet these days that actually was a bloody battleground for a time in late 1941. As it turned out however, fires were never lit in earnest inside of these circles because the Battle of Hong Kong lasted for less than a month -- beginning on the morning of December 8th, 1941 (less than 8 hours after the attack on Pearl Harbor) and ending with a formal surrender on Christmas Day that year. Close to six decades on, these outdoor stoves remain to serve as silent reminders of a time of turbulence that there hopefully will not be a repeat of any time soon -- but, also, if one were to take a closer look, a more innocent function. That is, someone has (or some people have) decided to turn a number of these idle stoves into flower pots out of which a variety of plants grow! On a day when the general sentiment is to wish peace and goodwill to all men (and women), I'd like to leave you with the image of colorful life growing out of something built in an atmosphere of fear and foreboding. In addition, here's also pointing out that on Christmas Day 1941, within hours of Hong Kong's surrender to the Japanese invaders, a group of British and Chinese military men managed to make a daring escape with the help of Chinese guerillas and local villagers -- and this daring feat is currently being commemorated in an exhibition at the Hong Kong Museum of Coastal Defence that runs through to December 2011. As regular visitors to this blog know, my general preference on days off is to head to parts of Hong Kong where I can be far from the madding crowd. However, there are occasions and events where I actually am happy to brave and mingle with the crowds -- or at least am reconciled to having to do so -- because I feel that what's on view in the area is worth the noise and jostling that goes with being around and among hundreds, if not thousands, of people. One of them is a commemorative event that has taken place in Victoria Park every June 4th since 1989. A happier event that also takes place annually in the Causeway Bay park -- only in the winter -- is the shopaholic delight that is the Hong Kong Brands and Products Expo. This year, I decided to go and check out the scene there on the first day of the 24-day, 900-booth consumer fair since, as I passed by the area on the way to lunch, I noticed that the crowds hadn't really thickened. Maybe it was because the sky was cloudy and grey and people feared that some rain would fall but I easily got an admission ticket before making my way into the outdoor expo's 28,000 square meters of exhibition space. Although I'm hardly known for my shopping tendencies and didn't have anything specific in mind to purchase that day, I still came away with some items -- some of which I know were being sold at a bargain price compared to what you'd pay at regular stores. And I also have to admit to enjoying gawking at the stall displays (many of which prominently featured images of celebrity spokesmen and -women (e.g., veteran thespians Kenneth Tsang, Cheng Pei Pei and Nancy Sit) or cutesy anthropomorphic mascots) and the occasional living, breathing local personality who was part of the expo scene. The first time I hiked the Dragon's Back, my friends and I began our hike from near the Tai Tam Gap Correctional Institution, then ventured southwards down the D'Aguilar Peninsula to To Tei Wan. But when my regular hiking companion and I went along the Dragon's Back earlier this year, we elected to follow the Hong Kong Trail Stage 8 the right way (i.e., from south to north) as well as all the way from To Tei Wan to Hong Kong Island's Tai Long Wan (Big Wave Bay) some 8.5 kilometers away. is sufficient adventurous excitement for me! Hong Kong Trail begins in less than glamorous surroundings! hiking trail, beach, sea, hikers and surfers meet! On September 25th, 2004, the Central Police Station was relocated from its historical premises at 10 Hollywood Road to Arsenal House at 1 Arsenal Street, Wan Chai. In the intervening years, the buildings, the oldest of which dates back to 1864, have largely lain unused and inaccessible to the public. Every once in a while, however, some artistic venture manages to incorporate a visit to the location (or nearby Victoria Prison) into its activities. For example, a couple of years or so ago, the Fringe Club staged a one-man show (starring Lee Chun Chow) about Ho Chi-Minh in Hong Kong and its audiences were invited to tour Victoria Prison where Ho Chi-Minh had served some time. And currently, the Central Police Station is playing host to a trio of exhibitions that are part of the inaugural -- and long overdue, IMHO! -- edition of the Hong Kong Photo Festival. Unquestionably the star exhibition, First Photographs of Hong Kong consists of room upon room of historical photographs taken in Hong Kong between the years 1858 and 1875. But Passion, the exhibition of black and white photographs by View Camera Club members, has a star draw in the form of a beautiful waterfall shot by celebrity member Chow Yun Fat while those who like to see color as well as black and white photos will be made happy that the Hong Kong 35mm Photographic Society's exhibition features a range of photos that make use of all the colors of the rainbow and more. Back in March of this year, I attended the Tai Kok Tsui Temple Fair that's held annually to thank the male deity for which the Hung Shing Temple was built for bringing luck and safety to his devotees. Although it rated a mention on the Hong Kong Tourism Board website, it very much is a local festival -- and its taking place in a Kowloon neighborhood that is off the beaten path for many tourists gave it a particularly attractively authentic feel to my mind. Something else that I liked about this festival was how eclectic it seemed to be -- with festival activities not only taking place within the small temple itself but also on nearby streets and including stalls selling food, toys and other items, an antique car exhibition, Chinese cultural performances, an old songs-themed karaoke, a 500-feet dancing dragon, and a display of statues of such as the main characters of Journey to the West, a Ming Dynasty epic saga that tells of a master monk and his disciples' adventure-filled pilgrimage from China to India in order to obtain sacred Buddhist sutras. As I child, I was given a 50 volume comic book version of what I later came to learn is considered to be one of the Four Great Classical Novels of Chinese Literature. I can't remember how long it took me to read all 50 volumes but it couldn't have been too long as I adored them -- and have strong memories of some of those tales to this day. Consequently, I could easily recognize (from left to right in the third photo from above in this Photo Hunt entry) the mischievous Monkey (AKA Sun Wukong, a Monkey God born from a stone), peace-loving Master Monk (AKA Tripitaka) on his white horse (a transformed dragon king), faithful Sandy (a river ogre -- but a good one!) and greedy Pigsy (a former heavenly commander banished to the mortal world after being found flirting with the moon princess!!) -- all of whom, I really noticed when looking for a suitable photo for this week, are male -- like so many of the main characters of classic novels from the West that I also enjoyed as a child (e.g., Robin Hood, King Arthur and Robinson Crusoe (and his Man Friday))! Cold in Hong Kong (Really!)! Shiver me timbers as well as brrrr! For when I went on the Hong Kong Observatory's website to check the weather and current temperature, I actually saw -- for the very first time in my more than 3 and a half years now in Hong Kong, if I'm not mistaken -- that a frost warning (signalling that frost is expected on high ground or inland in the New Territories*) is in effect!! More even than the report of students on an Outward Bound course in Sai Kung needing to be airlifted containing the news of the mercury plunging to -2 degrees Celsius at Tai Mo Shan sometime within the past 24 hours or my checking the Weather Underground website and seeing a current temperature of 1.7 degrees Celsius up on the Ngong Ping plateau, this has hammered home to me the fact that sub-tropical Hong Kong is currently experiencing weather that is unusually cold by its standards. Additionally, it has made me think that there really might be some truth, after all, in a colleague's report that the Chinese almanac actually forecast snow for Hong Kong this winter! Back in the summer of 2008, less than 3 months after I first arrived in Hong Kong to work and live, two friends took me to hike along Hong Kong Island's fabled Dragon's Back. Alas, as I duly reported, the day we chose to do so was less than ideal -- due to the high air pollution and bright sunshine that managed to filter through causing some some burn on our delicate skin! tame enough for mountain bikers to be allowed on it! wearing cycling helmets and other gear? to be taking part in a triathlon -- that's why! It's all relative... What with the weather forecast being cloudy with some rain patches, my regular hiking companion and I were feeling like hardy souls for having elected to go out hiking on this rather gray sky day. And this especially as we didn't see that many other people out hiking on the trail that we were on today. So, as we approached the end of our hike, we were feeling pretty good about ourselves along with our physical condition since, as a result of not being at all fatigued at the 3 and a 1/2 kilometer stage, we had elected to extend our hiking route for the day from 5 kilometers (Mui O to Nam Shan) to 9 kilometers (Mui O to Pui O -- i.e., Lantau Trail Stage 12, only backwards). As it so happens, a few minutes after we saw two pairs of triathletes going about their way, an ambulance and two police cars came roaring past us on what had hitherto been a pretty quiet road. (The last couple of kilometers of so of our hike were along a paved road.) Whereupon my hiking companion and I had a similar thought: Did one or more of the triathletes meet with an accident?? No question: Life in the fast-paced, high-pressured urban jungle that covers much of Hong Kong can be stressful and tough -- and some days, it can seem like there are only serious and grim faces to be found around you in the office, on the streets and in the MTR. But I actually have found that if you allow yourself some time to breathe and really look about you, there almost always will be a sight withing viewing distance that will strike you as either funny (haha) or funny (peculiar) -- or even both! -- and cause you to smile, break into a grin or even laugh out loud. Or maybe I just have an easily tickled funny bone! In any case, here's furnishing two visual examples in this Photo Hunt of things I've come across while going about living life in the Big Lychee that I think are funny (and yes, in more than one way) as well as speak to Hong Kongers -- not just the Japanese -- having a kawaii-streak. With regards to the first photo: I find it funny how the MTR authorities not only feel obliged to play "nanny" and tell people to hold on to escalator handrails (and not walk while on escalators -- something which I have to admit to tending to ignore, especially when I'm in a hurry) but do so with the help of a comic character that is a "penguin-ized" smiley face. "It's not just for children", I insisted to my German friend prior to my dragging her to view Ponyo on the Cliff by the Sea, the Hayao Miyazaki cinematic gem that first reached Hong Kong in January, 2009. And even though I had her convinced after she realized that the film screening we went to had far more adults than children at it, I still wish she could have been here in Hong Kong last night to go with me and witness the Ponyo theme song being one of the highlights of a Hong Kong Philharmonic Orchestra concert (that was so enthusiastically received that it got three encores and its conductor-guest star a standing ovation by show's end). Needless to say, this was no ordinary Hong Kong Philharmonic Orchestra concert -- not least since tickets for it sold out months before its program was even announced on the strength of the name of its conductor and main draw alone. Thus it was that upon fortuitously having scored a ticket for last night's Joe Hisaishi in Concert performance, I found myself impatiently checking out what was on the evening's programme -- and exulting to see Ponyo (along with music from Kiki's Delivery Service and two Oscar winners in the form of Spirited Away and Departures) in there... even while feeling a bit disappointed to see no music from My Neighbor Totoro on the official list. 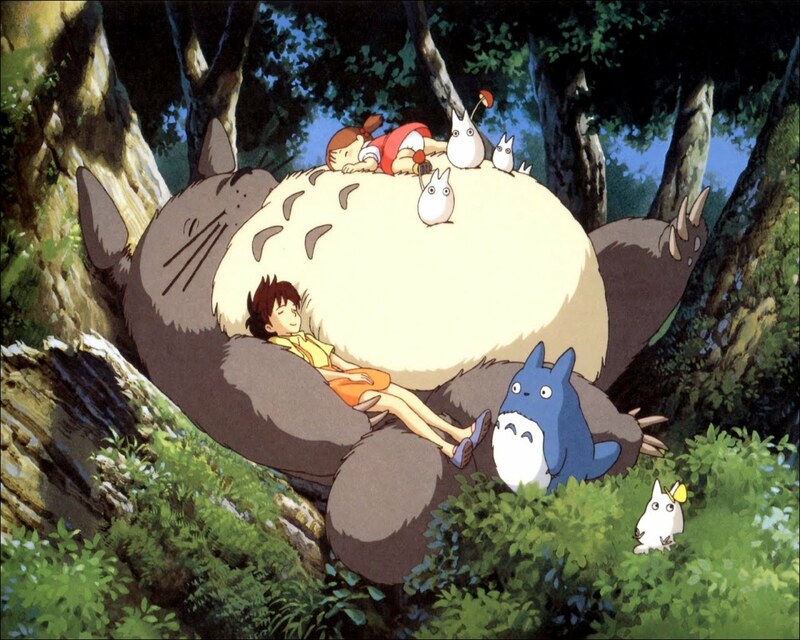 Happily, however, that music from My Neighbor Totoro did indeed get played before the concert drew a close. And while I did very much enjoy a lot on the programme (including the composer's African-inspired, percussion-heavy Mkwaju 1981-2009 and the musical piece from Nobuhiko Obyashi's Water Traveller) and found a big grin plant itself on my face upon hearing the Ponyo theme song being played by the Hong Kong Philharmonic Orchestra, I have to truthfully state that hearing the My Neighbor Totoro music being played represented the highlight of the evening for me -- and actually caused me to cry with happiness! In addition, there is something really precious about being able to not only see and hear the composer of music you love so but also thank him by way of thunderous applause and a standing ovation. And call me a philistine but, in all honesty, give me the music of Joe Hisaishi over many other composers -- including not only many other his contemporaries but also classical music luminaries like Bartok (whose music has literally given me a migraine on more than one occasion!) -- most any day!